scientific research and educational uses associated with the natural environment. Between 1964 and 1974 Canada participated in a decade of research known as the International Biological Program (IBP), a worldwide endeavor involving 58 nations. A subcommittee for the Conservation of Terrestrial Communities (IBP-CT) was created, aimed at the establishment of a system of representative terrestrial and aquatic ecosystems around the world. In Canada this was largely funded by the National Research Council, and involved the description of biologically important sites on standard international check-sheets. Nearly 1000 check-sheets were completed in Canada, placing this country at the forefront of IBP-CT efforts, along with Australia and the United States. Many such sites were identified in British Columbia, and these became the nucleus of our present ecological reserves system. The IBP check-sheets are still an important, and in some cases, the only source of descriptive information for many British Columbia ecological reserves. The next step was to legally and permanently protect the identified lands, as an effective conservation program requires more than identification and description of important ecosystems. Most public lands in British Columbia are under provincial jurisdiction so the provincial government became involved. 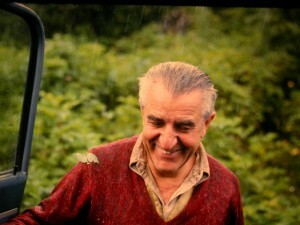 Encouraged by the late Dr. Vladimir Krajina (at left, former professor at the University of British Columbia) and other scientists, the government of BC agreed, in 1968, to form an Ecological Reserves Committee that would advise on the selection of potential reserve sites. A year later, the government formally embarked on setting aside ecological reserves under the Land Act. A list of the reserves proposed at the meetings between 1968 and 1984 is contained in this 44 page PDF file. In 1971, the Legislature gave unanimous approval to the Ecological Reserves Act. With this act, British Columbia became the first province in Canada to formalize and give permanent protected status to ecological reserves. Quebec, the second to do so, established a similar act in 1974, and New Brunswick in 1975. Other provinces have since enacted similar legislation, or use other legislation such as Land, Park and Museum Acts for designation of natural areas. On May 4, 1971, the first 29 reserves received protective status by Order-in-Council – a conservation landmark for the province. A full-time ecological reserves coordinator was hired in 1974, regulations related to use and protection of the reserves were enacted in 1975, and a volunteer warden program put into effect in 1980. By 1985, the Ecological Reserves Committee had been dissolved and the Ecological Reserves program had been moved to the jurisdiction of the Parks Branch, which currently administers it. How are Ecological Reserves created? Prior to the 1990s, any member of the public could propose an area as an ecological reserve. In the past, proposals have been put forward by scientists, educators, government agencies and naturalist/conservation groups. Proposals submitted were reviewed by BC Parks to determine the significance of the natural values present, the relationship of the area to other ecological reserves and protected areas, and whether the proposal filled existing gaps in the ecological reserve system. Following the review, proposals were referred to all interested government ministries and agencies to ensure conflicts with other land or resource uses were not present. Where values were considered significant and land use conflicts were resolved, the proposed area was designated by provincial order-in-council under the Ecological Reserve Act. In the 1990s, the provincial government embarked on a province-wide program of land use planning. At the regional and sub-regional level, round-tables were established of government agencies, First Nations, public stakeholders, environmental organizations and industry representatives. Recognising the importance of the identification and dedication of a system of natural features and communities representative of the geographically and biologically diverse environments of BC, the Protected Areas Strategy was developed with two primary goals: to protect viable, representative examples of natural diversity in BC; and to protect special natural, cultural heritage and recreational heritage features. In order to meet the goals of the Protected Areas Strategy, the land-use planning tables worked to determine land use designations over set geographical areas, including in their decisions the selection and designation of protected areas and the type of designation that they would receive (Park, Ecological Reserve or Protected Area). Ecological reserves are established for the maintenance of biological diversity. They assist in developing and promoting an environmental consciousness and provide outdoor laboratories and classrooms for studies concerned with the natural environment and they are benchmarks against which environmental changes can be measured. As many ecological processes are as yet poorly understood, today’s scientists cannot predict some of the questions that will require research in unaltered ecosystems. Ecological reserves keep our options open for the future. Ecological reserves provide a “genetic data bank” which may hold the key to new discoveries in forestry, ecology, agriculture and medicine. Ecological reserves contribute to the maintenance of biological diversity and the protection of genetic materials. Appropriate research and educational functions are the primary uses of ecological reserves. They are not created for outdoor recreation and should not be confused with parks or other recreational areas. Most ecological reserves, however, are open to the public for non-consumptive, observational uses, such as nature appreciation, wildlife viewing, bird watching and photography. Parks and ecological reserves, although serving somewhat different purposes, complement one another. Together they provide a wide range of opportunities for people to experience and learn from the natural world. An important characteristic of ecological reserves is their permanence. Accordingly, scientific research is one of the principal functions of ecological reserves. Ecological reserves are suited to long-term research, or longitudinal study, where permanent plots or observation stations can be established, allowing the scientist or researcher to return to often, over time. Such types of research and other basic research related to the study of natural processes are encouraged in ecological reserves, provided it is not detrimental to the values of the ecological reserve. Researchers may prefer to use sites that already have an existing stock of research data upon which to build, as past research has established a foundation of data upon which new research activities can be built. Ecological reserves also offer opportunities for a wide range of educational activities-ranging from simple observation and nature interpretation to the teaching of complex ecological processes. Under permit, all levels and institutions of education may visit all but a few very sensitive ecological reserves. As surrounding environments are progressively altered by human activities, ecological reserves assume an ever increasing significance for the demonstration and study of original ecosystems. BC government passes Ecological Reserves Act, Ecological Reserves (ER) are to be surveyed, proposed, and established based on principles established by the International Biological Program. Dr. Vladimire Krajina’s (1905 – 1993) goal is to protect 1% of BC’s land area in ERs. 29 ERs are created, including Cleland Island, a seabird colony west of Tofino, and the smallest reserve, Canoe Islet, a 0.61 ha island off the SE tip of Valdes Island. 14 ERs created, including Mara Meadows, a unique low level swamp. Dr. J. Bristol Foster is first Coordinator of Ecological Reserves Program. Gladys Lake, Spatsizi Reserve (#68), BC’s largest ER is created-33,185 ha. 17 other ERs established, including the Great Blue Heron Nesting Site on the UBC Endowment Lands. One ER created, Clanninick Creek (#75). Dr. Jim Pojar hired as Botanist for ERs. Campbell-Brown Reserve, the first private property donated as an ER, is given to BC by Hugh Campbell Brown in memory of his parents who farmed the area from 1913 – 1943. 93 established reserves; 297 applications for ERs remaining. 3 new ERs created, including 2 seabird colonies-Anthony Island and Kerouard Islands. Dr. Hans Roemer hired as Botanist. A marine ER at Race Rocks is established after extensive student lobbying at Lester B. Pearson College. Lynne Milnes hired to manage a new Warden Program for ERs. 1st edition of the Ecological Reserves Newsletter is published. 1,248 ha totally marine Michael Bigg Robson Bight ER established. Insufficient funding to maintain the government ER newsletter inspires the inception of Friends of Ecological Reserves (FER). A fund-raising auction in October 1982 realizes start-up costs as artist Robert Bateman donates proceeds. Charter members include Laurie Milmine, Trudy Chatwin, Peggy Frank and Peter Grant. FER incorporates as a non-profit society January 29. Charter members of the society are Allison Watt, David Avren, Mary-Lou Florian, Peter Legg and Lori Milmine. Vicky Husband is President of FER (until 1988). Khutzeymateen Valley adopted as a project. ER program moves to jurisdiction of Parks Programs Branch of the Ministry of Lands, Parks and Housing. Katherine Tye Reserve (#116) is created protecting one of Canada’s rarest flowers, the Phantom Orchid. Vicky Husband receives UN Global 500 award (outstanding contributions to the environmental field). 3 ERs incorporated within the newly created South Moresby National Park Reserve. Finally, the proposed Windy Bay ER is protected. Haley Lake ER (#117) is established- a significant colony of the endangered Vancouver Island Marmot. Wayne McCrory and Herb Hammond hired as consultants on the Khutzeymateen project. 406 m of fencing completed at Mt. Tzuhalem ER (#112). A Guide to Ecological Reserves in BC is published. 412 ha added to Robson Bight ER. Brackman Island purchased by the Nature Conservancy of Canada, turned over to the Nature Trust, and leased to ER program. Minister of Environment announces a three-year study of Khutzeymateen to assess the impact of proposed logging on grizzly bear population. 5 ERs within the Tsitika River drainage created-less than 5% of the Tsitika watershed is protected. Nestucca Oil spill off Washington impacts every sea-bird ER on the west coast of Vancouver Island-the estimated bird kill 30,000 – 60,000. FER raises over $100,000 to study and protect the Khutzeymateen Valley. 6 ERs created: total 131 reserves; 124 viable proposals remaining. Six proposed ERs will be protected by inclusion in existing provincial parks. FER research provides funding to Irene Manley and Dr. Alan Burger who helped find Canada’s first Marbled Murrelet nest in the Carmanah- Walbran valley. Parks Plan 90 and Wilderness Area Plan announced. 2 ERs added (Gamble Creek, Ellis Island); 2 are enlarged (Haley Lake, Oak Bay Islands). ERs now managed by BC Parks; management of ERs and support for volunteer wardens is fully decentralized. Government announces that Khutzeymateen Valley is to be protected as a Class A Provincial Park. 9 ERs proposed by BC Parks. The Log records Dr. Krajina’s obituary. 131 reserves protect 160,000 ha, of which one-third are marine areas. In over 25 years, little more than 1/10th of Dr. Krajina’s conservation vision has been realized. Government policy now requires BC Parks to issue permits for field trips to ERs. Proposed amendments to Ecological Reserves Act would allow for legal definition of boundaries of ERs, to increase penalties for infractions of the Act and to identify inappropriate activities in ERs. 8 new ERs established on Vancouver Island, the first reserves created since 1991. FER partners with TLC to bring land stewardship options (The Landowner Contact Project) to the Cariboo- Chilcotins. A massive campaign to protect the Vancouver Island Marmot (Haley Lakes ER, among other locations) is launched by the Nature Trust of BC and others. Race Rocks ER is announced as a Marine Protected Area. Hans Roemer in the Tahsish watershed. Year 3 of the Landowner Contact Project is successfully completed. The Vicky Husband Scholarship, to be awarded anually, for environmental studies at the University of Victoria is established. 5 new ecological reserves are established in northern BC, as well as one new ER in the Gulf Islands. Researcher Pam Janszen finds 53 not previously observed species of fungi in ER15. Major reorganization and down-sizing of BC Ministries including Water, Land & Air Protection (WLAP) and Sustainable Resource Management (SRM) which contain all the elements of the Wildlife, Fisheries, Habitat Protection and Parks Program which had been included in the former Ministry of Environment, Lands and Parks (MELP). Publication by FER of the new Ecological reserves map and Ecological Reserve Descriptions.